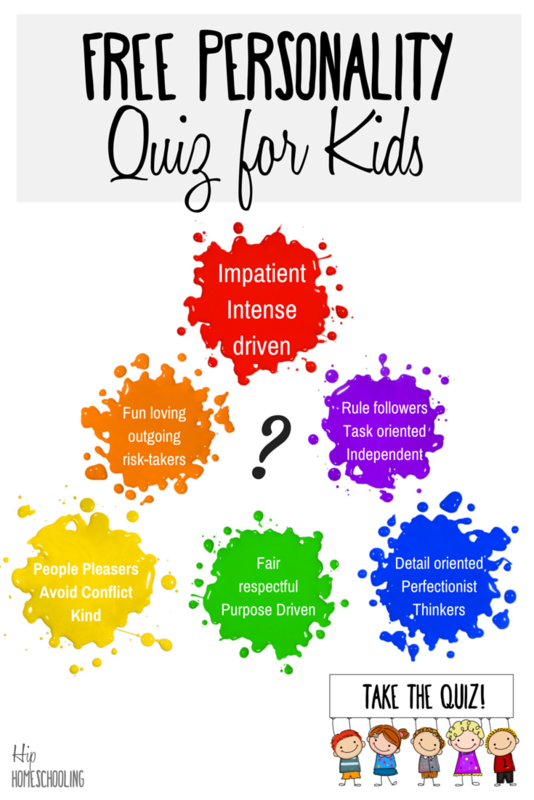 Personality Test for Kids: Take the Free Quiz Today! I don’t think anyone would say they know their kids “too well.” The reality is, as our kids grow and change, we are all trying to understand them better so we can parent them as best we can! After creating the Learning Style Quiz last year, I wanted to create a new quiz that would help you understand your children better. This personality test for kids is designed to help you discern your child’s personality color. What is the personality color test? There are 6 main personality colors: yellow, orange, red, purple, blue, and green. Each one has their own unique characteristics that set them apart. That’s all fine and dandy, but how can we figure that out for our children? And how on earth do we apply our knowledge of their personality in how we deal with them and relate to them? Enter the Hip Homeschooling Personality Quiz! This quiz will tell you the primary color your child relates with, what that color is defined by, and how you can use that in your parenting style with them. It is a comprehensive quiz, with 50 questions to help target all the different personality types and give you a solid overview. As you take this test, I suggest setting aside about 5-10 minutes (per child you are doing this for) in a quiet place where you can concentrate on the questions. Take the time to envision your child in situations and scenarios and how they would respond now, not last year or even last month. Our kids are constantly changing. As you get the hang of the quiz and the different colors, you may start to guess what color your other children are, your husband, yourself even. However, you may be surprised! Both my husband and I took the quiz and our results were not ones we would have chosen for eachother from merely reading the personality traits. It is key that you take the time to answer these questions, have a notepad and pen ready and make some notes throughout as inspiration hits you if you want. As you come to the end you will receive the color analysis, read the overview and think about what you can add. This is such a great time to just mark down notes about your child, re-evaluate how to talk with them and approach various situations, and just understand them better! What is your child's personality? Comment below! My guy’s purple… have to agree. The only thing it didn’t include is that he is absolutely literal with very little imagination… it makes reading fiction a challenge and creative writing almost impossible. That is an interesting point, my husband came out purple, and I was thinking “no, I don’t think that’s right” but as he read the description, he was 100% “yup, that’s me” so funny! My son came up as green in 85%. I’m not sure I totally agree. Like me, he’s borderline on many of those questions. I tried to think of him overall. The “Is your child gentle” question was tough. He is very gentle and nurturing but he can be high energy and rough. He isn’t always gentle. Hi Ashley, I do think that is a hard question. I think a lot of kids are gentle at times and rough at others, it’s hard to tell what they really are until they’re a bit older. The younger a child is, the harder it is to discern if it is natural child behaviour or personality behaviour. Yes that is a hard question but there is always a right answer. My son is 100% orange! He is so engaging and fun but also demanding. Everyday is an adventure! Green and that is so accurate it’s scary. “Why”, “what for”, and “how come” are some of his favourite sayings. I gave all three of my children the test! Each child resulted in a different color; one orange, one yellow and one blue! Do you have any advice on teaching them all together?! Before taking this quiz, I laughed. My sons favorite color is red. He is what some call type A. He’s bossy, has to make sure everyone follows the rules. Has to be first in line. Has to make sure everyone gets the same exact amount etc., etc. He tries to get everything he can in the color red 🙂 But for all that, he tries to also make sure that everyone gets a fair deal, that everyone gets a turn, he’ s the younger brother of an ASD older brother that he keeps a good eye on and watches out for. He’s very loving and kind, even if he’s a bit anxiety prone! I got purple. It is mostly true, but one part says ” your child values rules over relationships” I love keeping my relationships with my family and friends tight and secure.i do like to enforce the rules but not so much that i would rather choose rules over my friends and family. My child is yello. Had I know these important facts I would have molded what I say to her around her personality. Hope this works this time! How do these color categories relate to Myers Briggs categories? How can I download this test? It’s very good for parent-kids activity! I am purple. Yay !!!!!!!!!!!!!!!!!!!!!!!!!!!!!!!!!!!!!!!!!!!!!!!!!!!!!!!!!!!!!!!! this is so stupid and nothing like how I act. My child got 100% orange. I read the description and it is completely true. My daughter is orange and if thats not true I do not know what is. I’m so so so orange. To me getting lost in the woods is a dream come true.